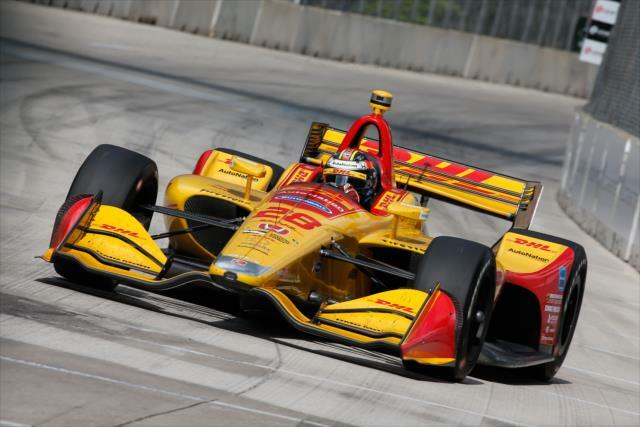 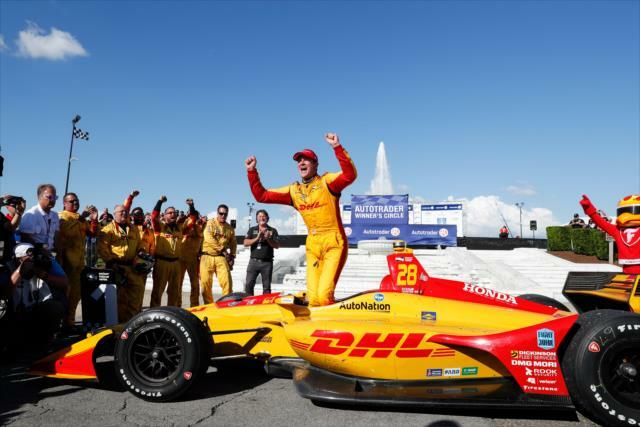 Ryan Hunter-Reay may not have started a tradition, but he hopes he started a pattern. 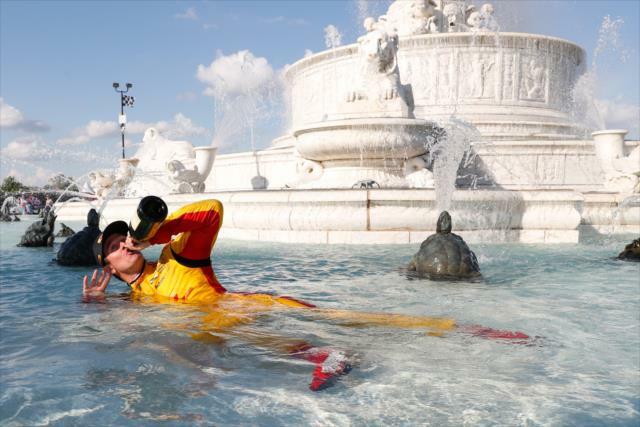 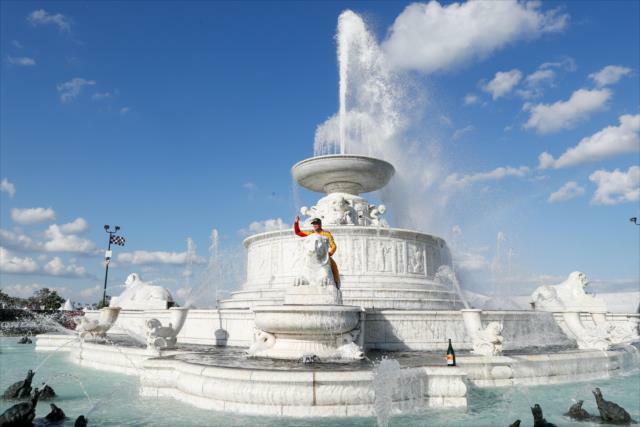 And a post-victory jaunt into the iconic James Scott Memorial Fountain at Belle Isle Park may not have the resonance of kissing the Indianapolis Motor Speedway bricks, but it was as refreshing as ending his 42-race winless streak on Sunday in Race 2 of the Chevrolet Detroit Grand Prix presented by Lear. 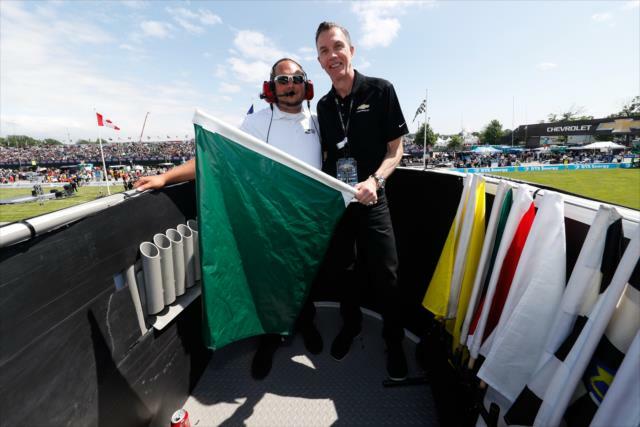 So, after winning Sunday’s race by more than 11 seconds, among the first people the Andretti Autosport driver encountered was the same TV crew. 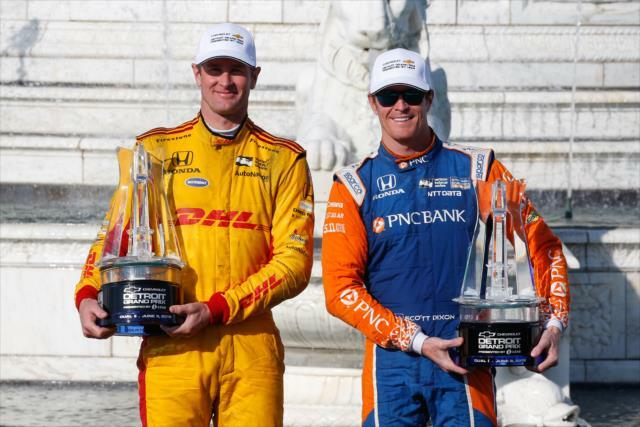 Hunter-Reay’s predatory overtake of teammate Alexander Rossi seemed much the same – no problem – but belied the effort he and his No. 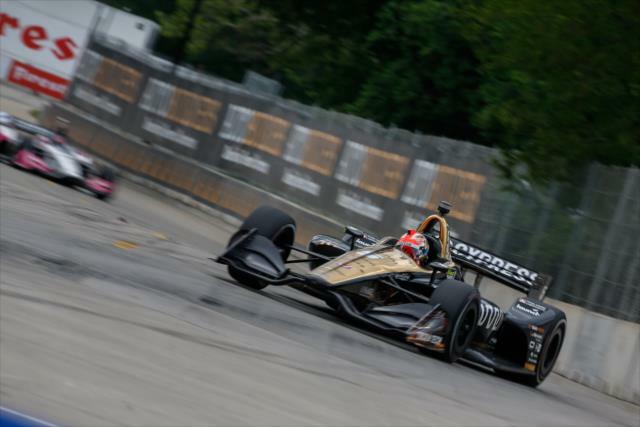 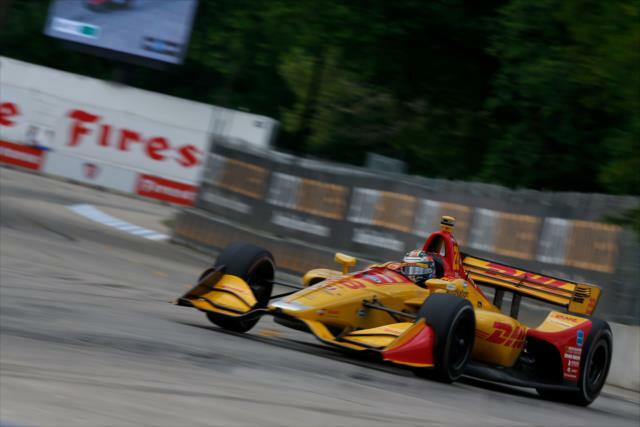 28 DHL Honda crew exerted in using a three-stop strategy to seize control in the final seven laps of 70 around the Belle Isle temporary street course. 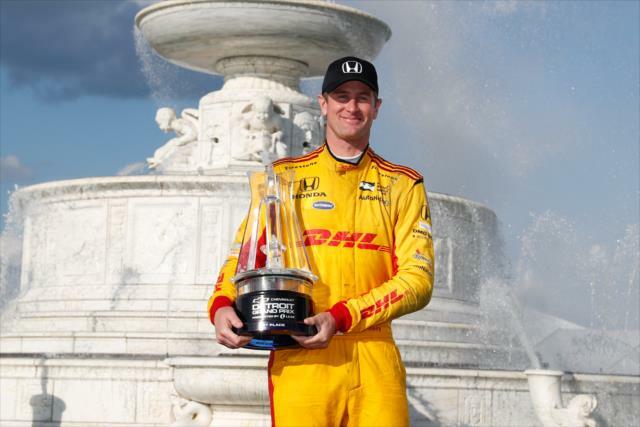 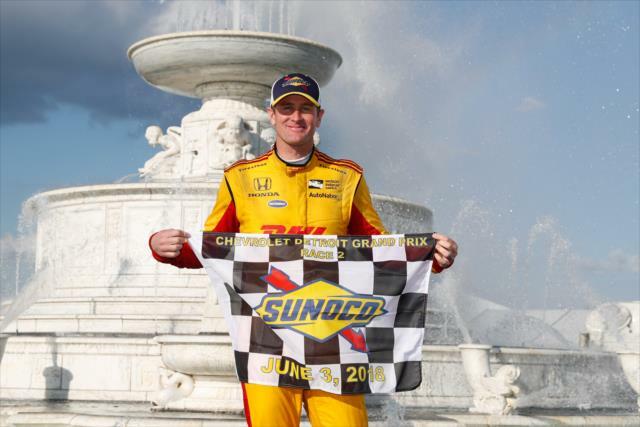 In doing so, Hunter-Reay picked up his first Verizon IndyCar Series victory since Pocono Raceway in August 2015 and ruined what looked like a perfect plan coming together for Rossi. 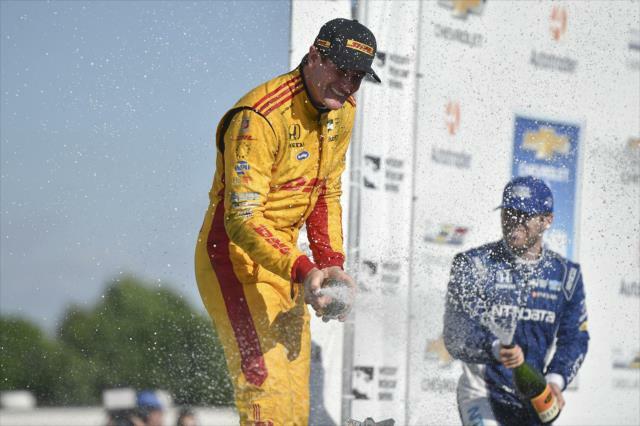 Hunter-Reay closed a seven-second gap to Rossi following the last round of pit stops and forced Rossi to slide off course, take the lead and win for the 17th time in his Indy car career. 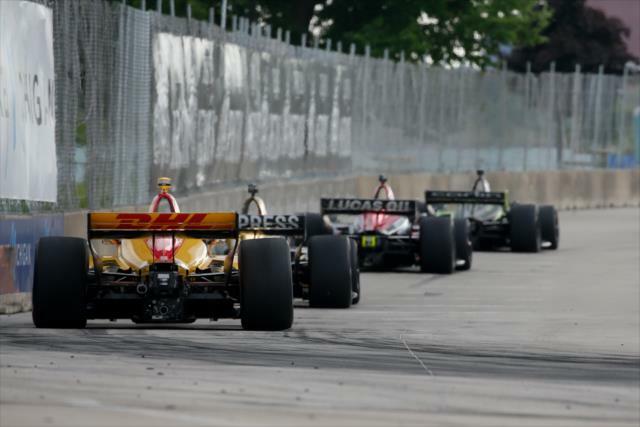 Rossi was on a well-orchestrated two-stop strategy, but locked his tires on consecutive laps with Hunter-Reay in hot pursuit. 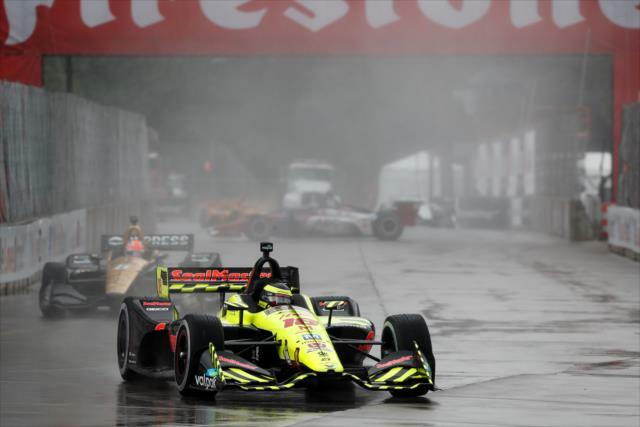 After the second lockup, Rossi’s left front tire shredded and he slid into the Turn 3 runoff on Lap 64, opening the door for Hunter-Reay to grab the lead. 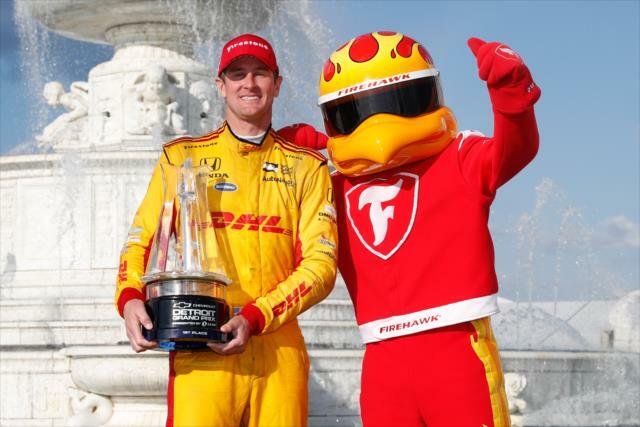 “I got to him, I think, with 11 laps to go, on his gearbox, and from there, I just started to see where am I catching him, what corners is he weaker,” Hunter-Reay explained how he sized up his prey. 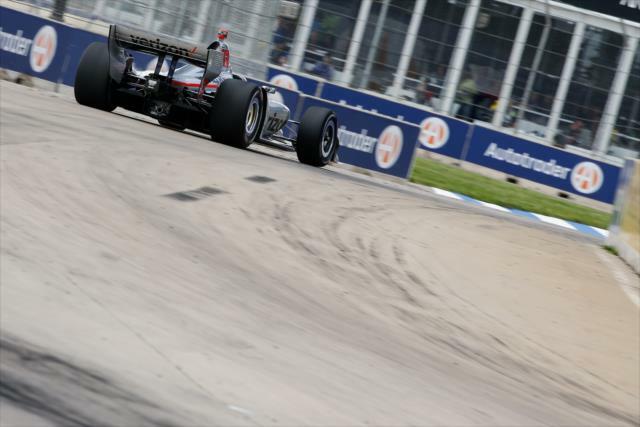 “I found that Turn 1 and 2 was the place that I was catching him quite a bit, so I just kept putting pressure on. 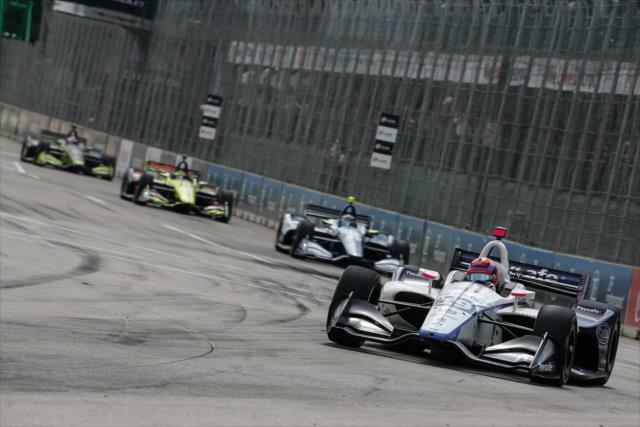 Rossi, who had won races after his two previous Verizon IndyCar Series poles, said he didn’t understand what happened to his car’s performance at the critical juncture. 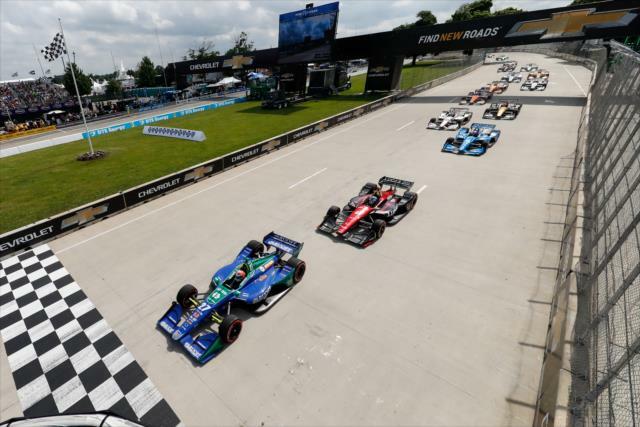 "It was a pretty disappointing day considering we led the most laps and started on pole," said Rossi, who wound up in 12th place and lost the points lead he had taken in Race 1 on Saturday. 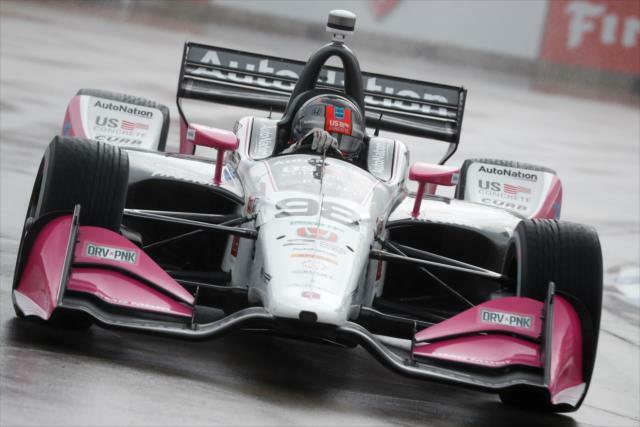 "Unfortunately, with less than 10 laps to go, our luck changed. 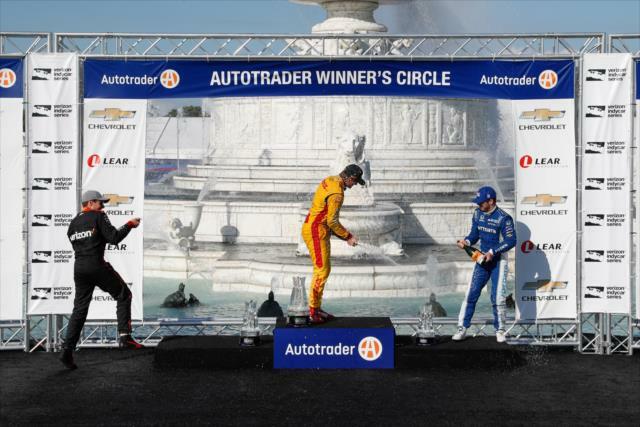 We're not really sure what happened. 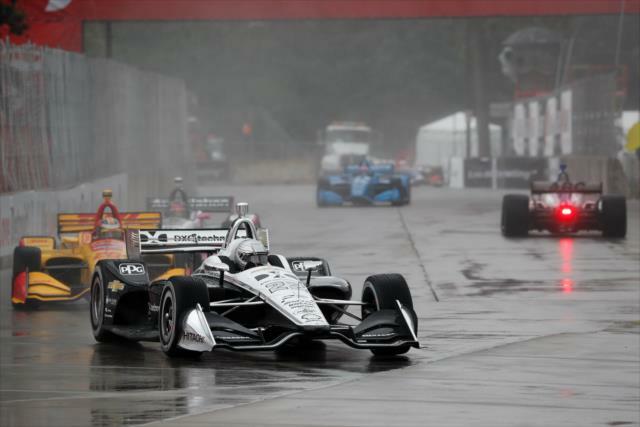 We're going to investigate to see if something went wrong because it was a very abnormal issue to have when we hadn't experienced anything remotely similar all weekend." 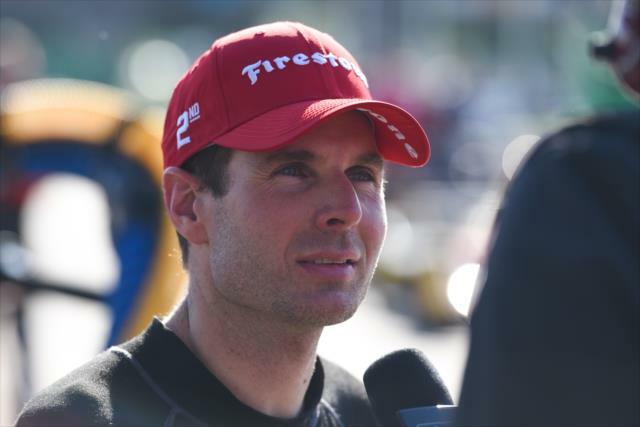 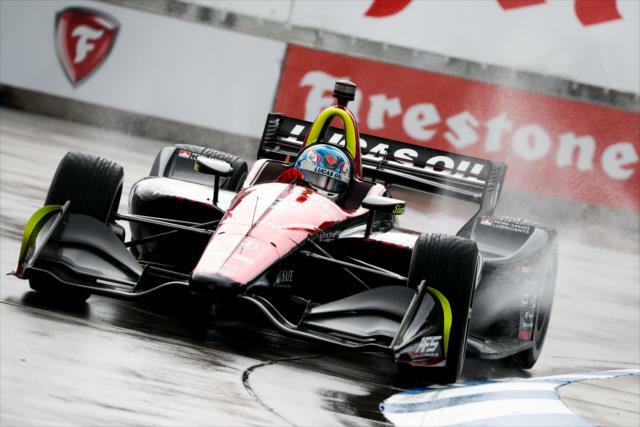 Team Penske’s Will Power finished 11.3549 seconds back in the No. 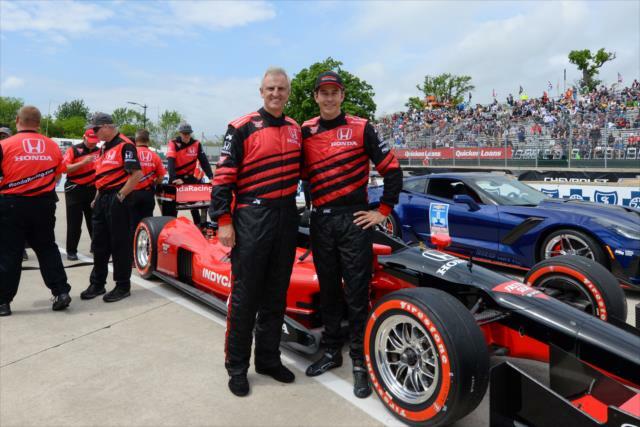 12 Verizon Team Penske Chevrolet, allowing the recent Indianapolis 500 winner to re-assume the championship lead. 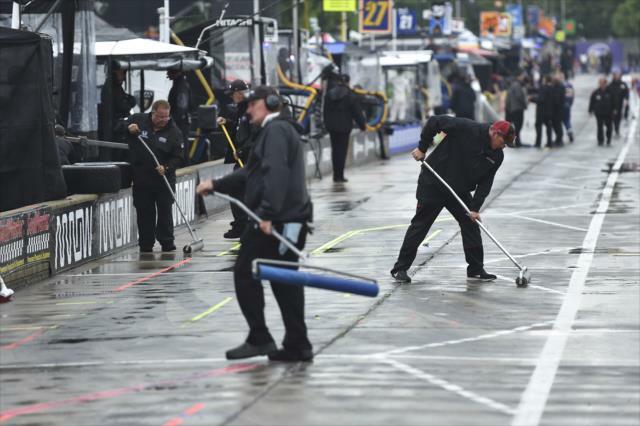 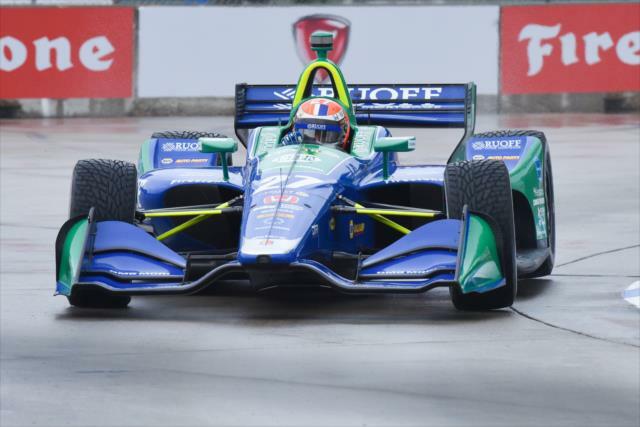 Chip Ganassi Racing’s Ed Jones and Scott Dixon finished third and fourth, respectively. 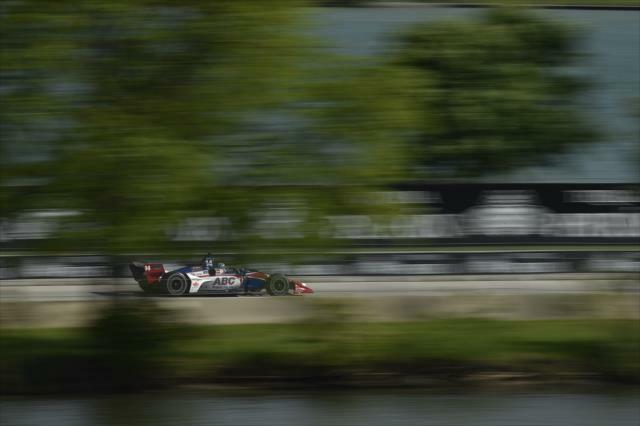 The weekend was fruitful for Dixon, who won on Saturday and trails Power by five points in the standings. 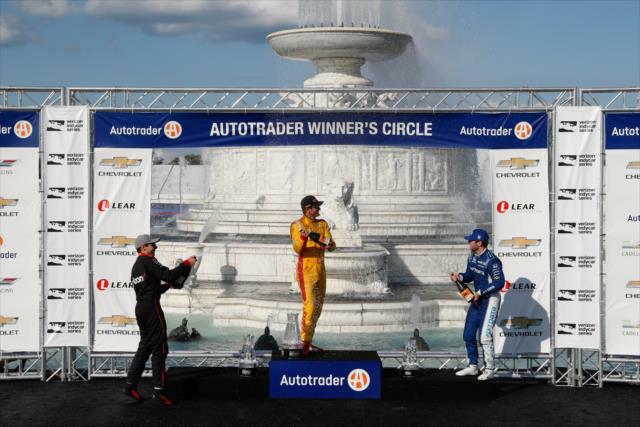 For Jones, the third-place finish equaled his career best. 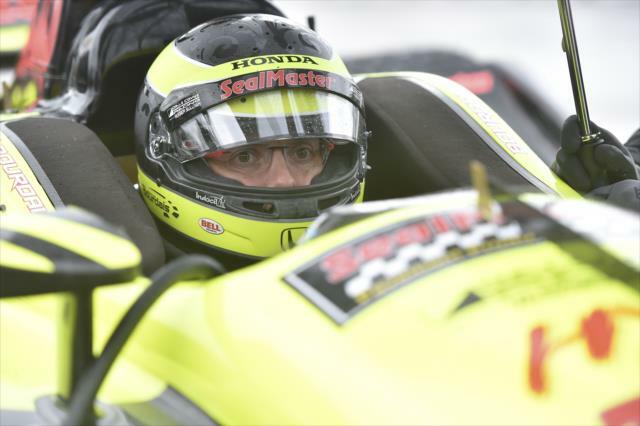 Rossi fell to third in the championship, 11 points back. 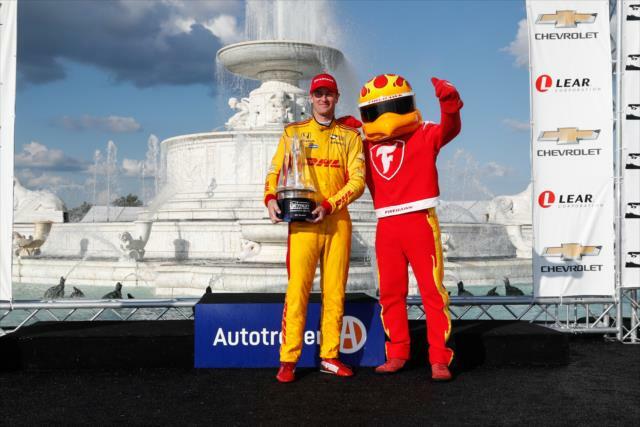 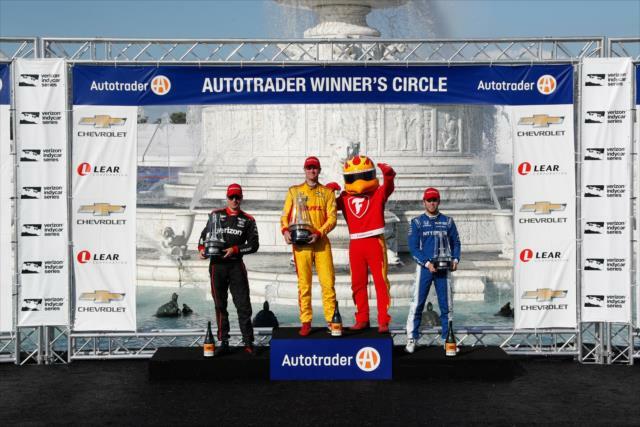 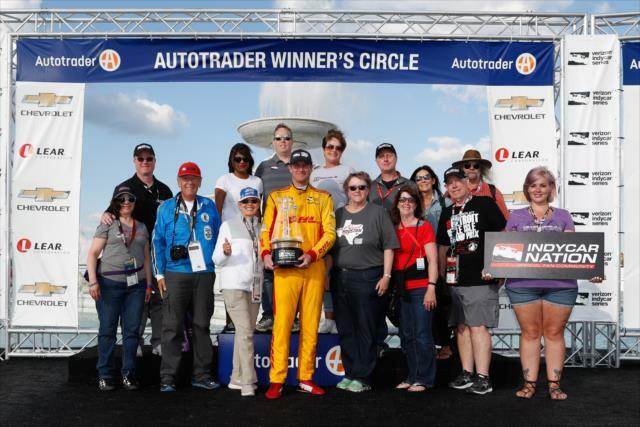 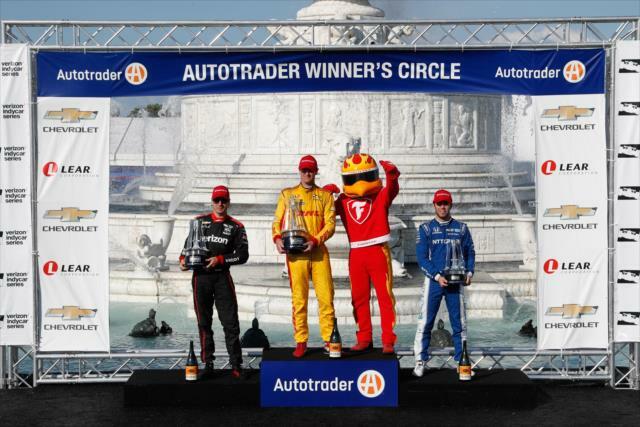 Hunter-Reay is fourth, 31 points back, but encouraged after wondering when a litany of near-misses would be converted to wins as in his 2012 championship campaign. 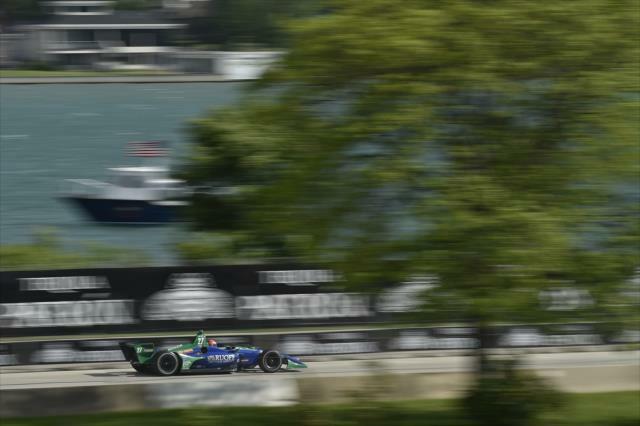 “It went through my head a lot,” he admitted. 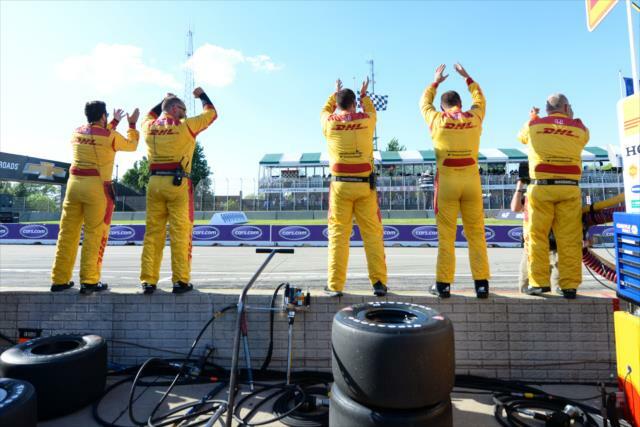 “But I know I have the team behind me to do it. 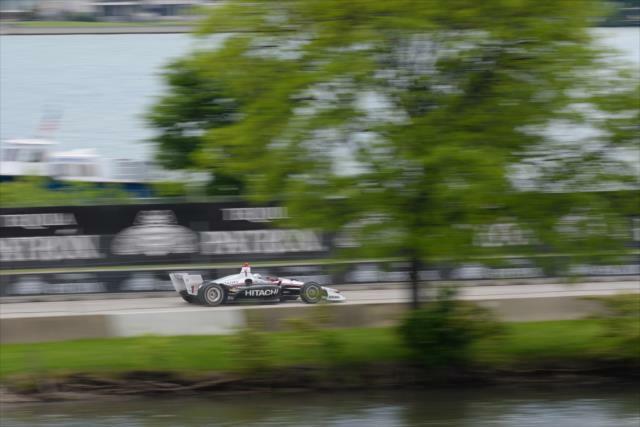 I know I can do it with the right car. 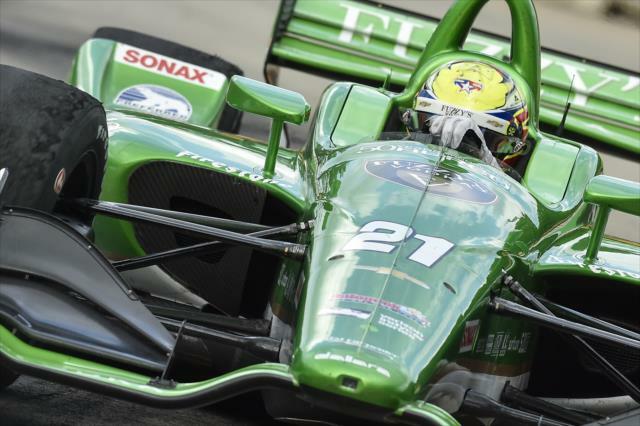 I know I have the talent to win the races and just have to think positive. 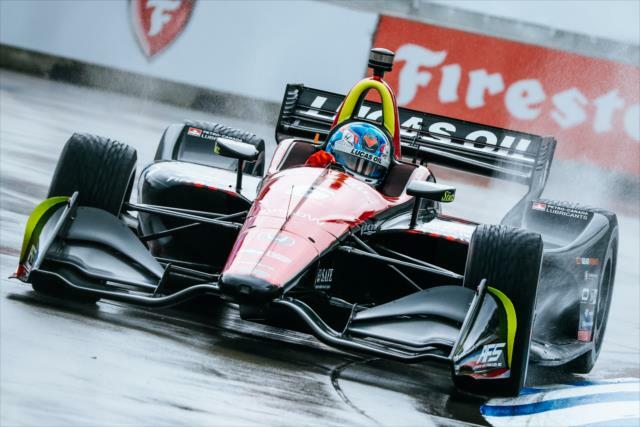 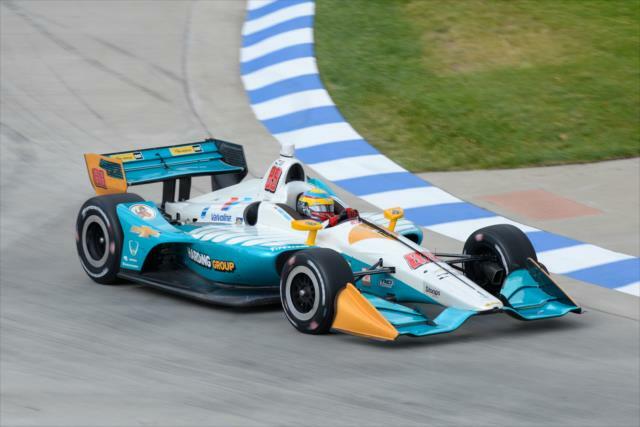 The 20-year-old American made his Verizon IndyCar Series debut earlier this season at Detroit. 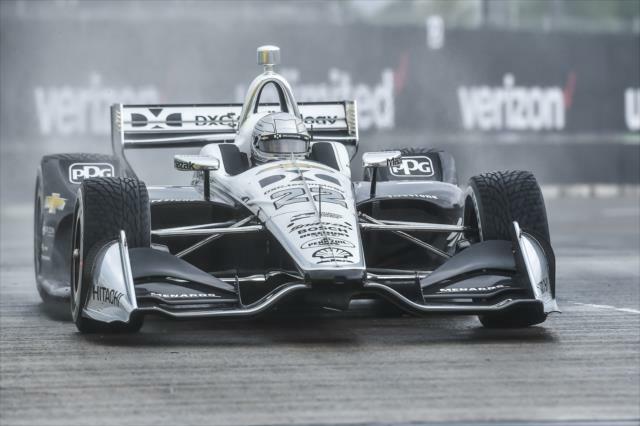 Like Will Power after the Indy 500, there's been much to scream about so far this year. 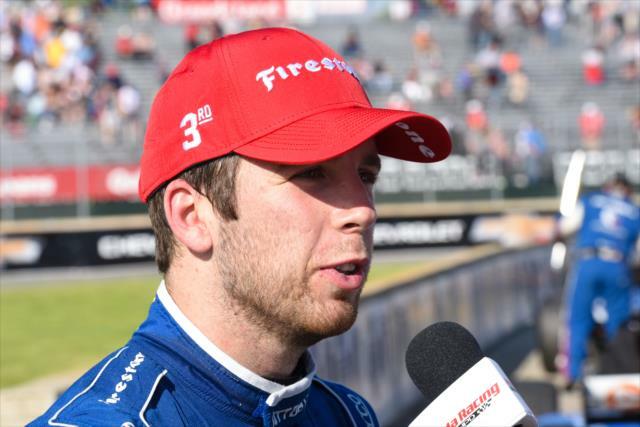 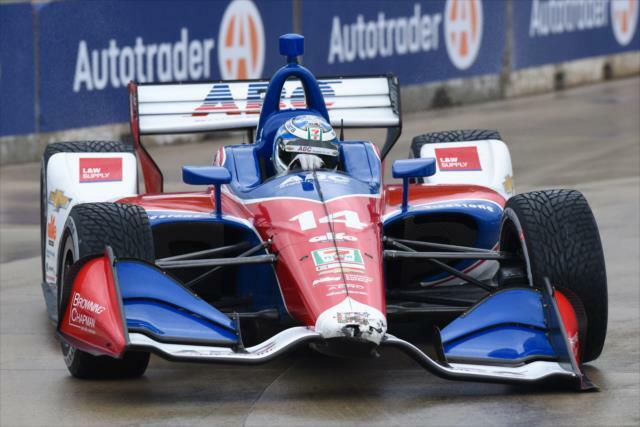 The Andretti Autosport driver wins for the first time in 43 races, since August 2015. 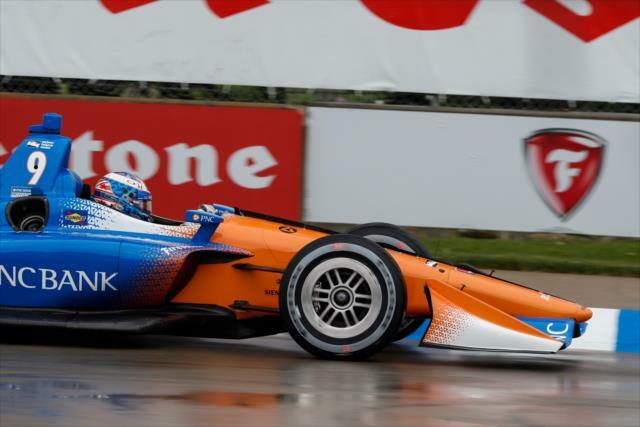 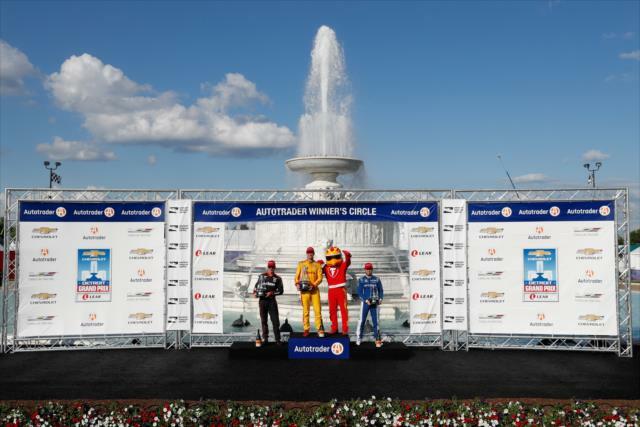 The second half of the Chevrolet Detroit Grand Prix doubleheader featured a duel between Andretti Autosport teammates. 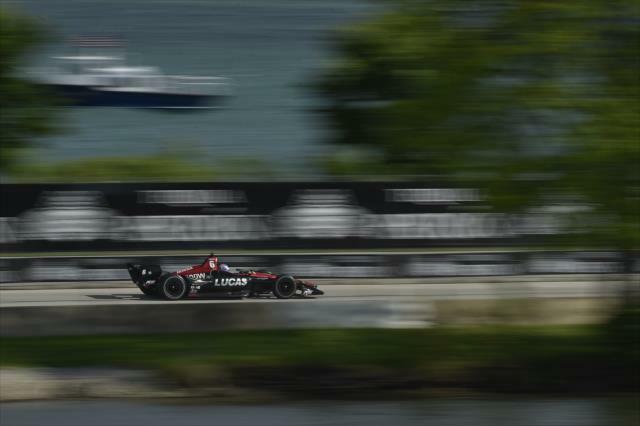 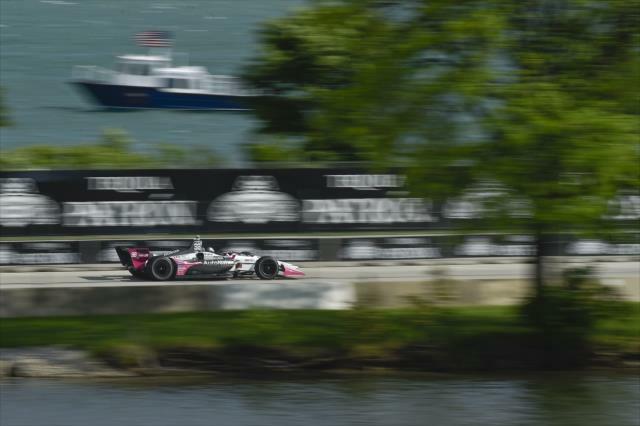 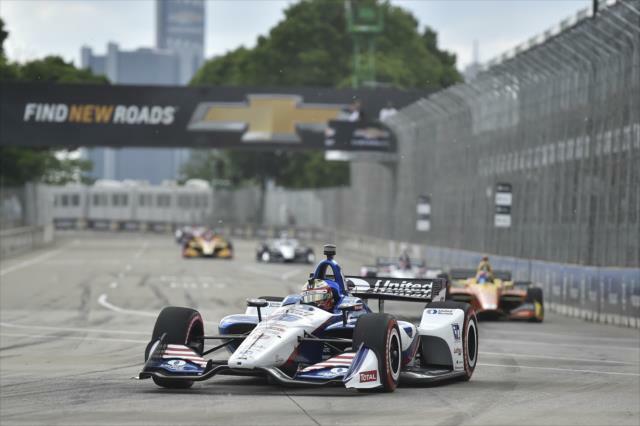 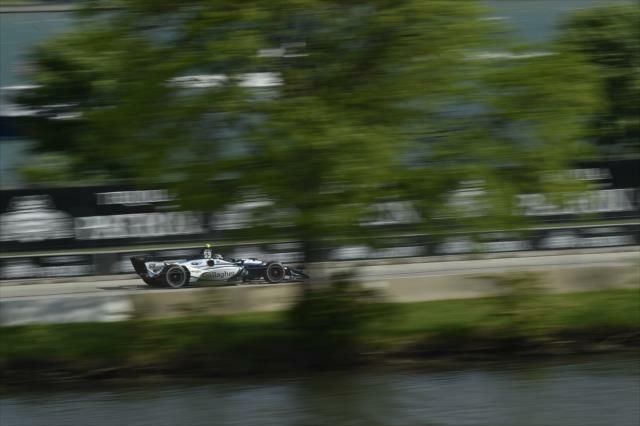 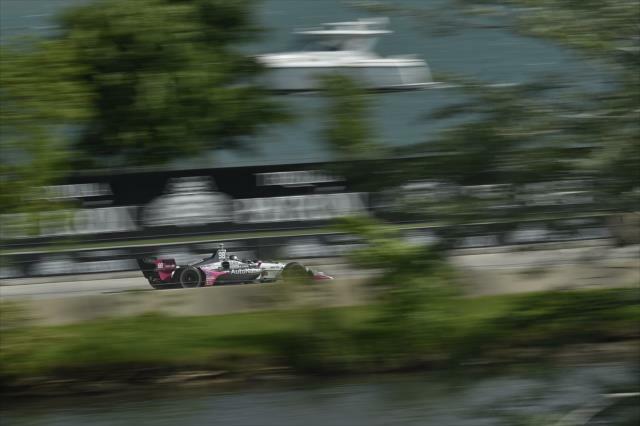 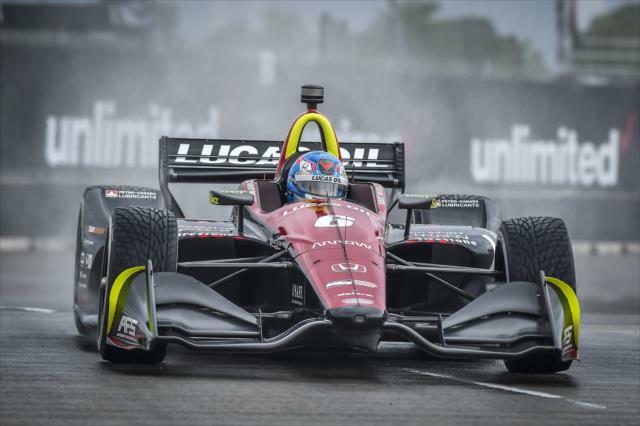 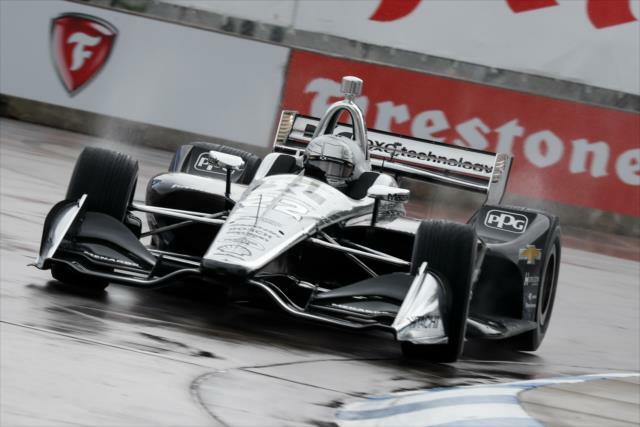 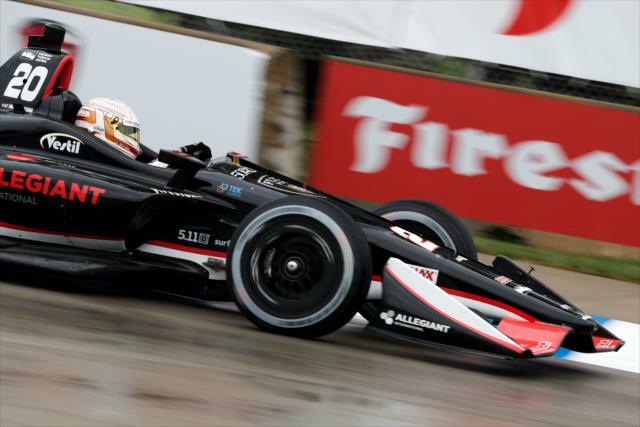 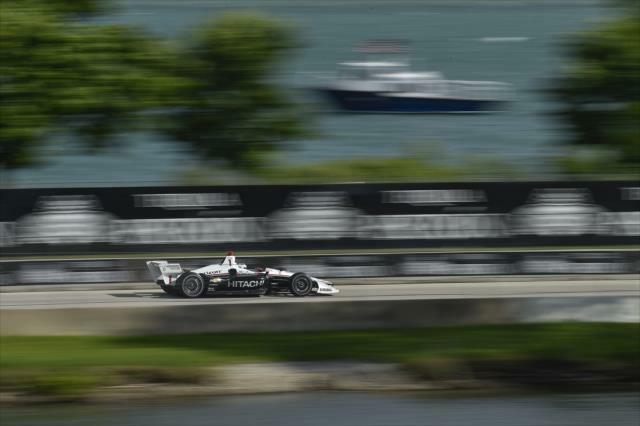 Will Power and Graham Rahal have strong histories on the Raceway at Belle Isle Park temporary street course. 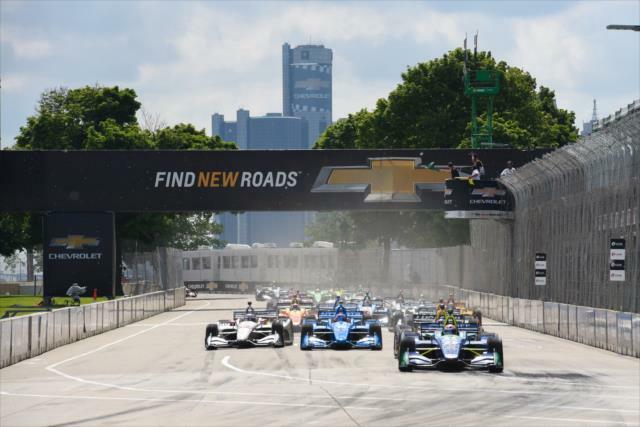 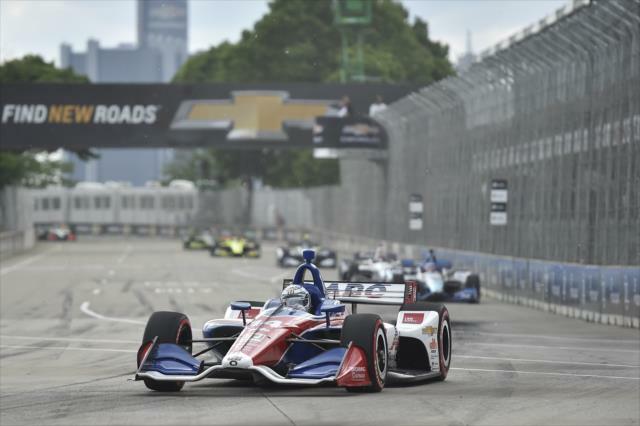 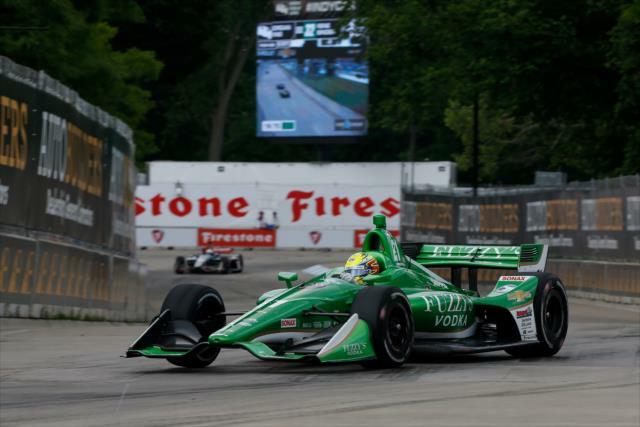 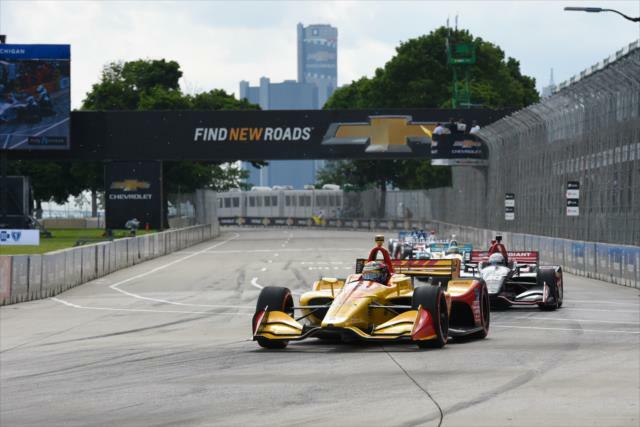 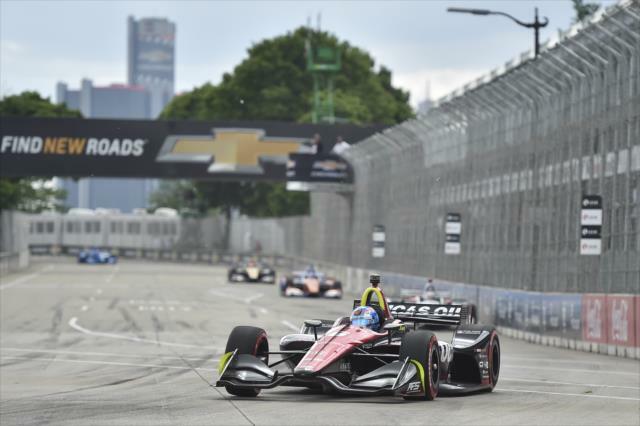 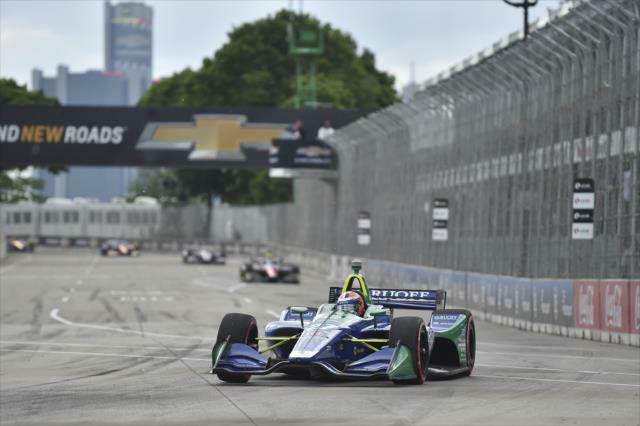 The 2.35-mile, 13-turn temporary street circuit on Detroit's Belle Isle presents numerous challenges to drivers -- from hard braking zones to speedy straights. 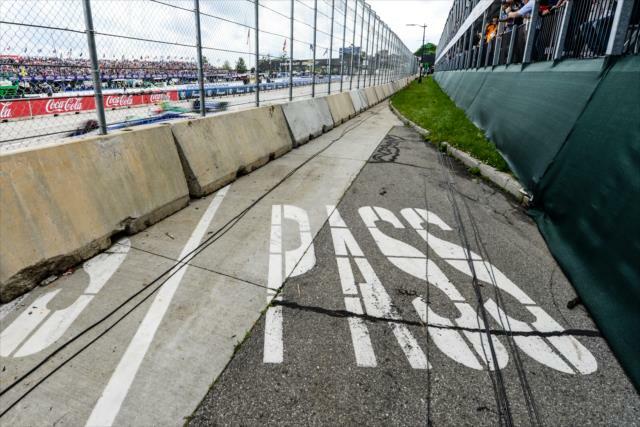 The same areas are ripe for overtaking. 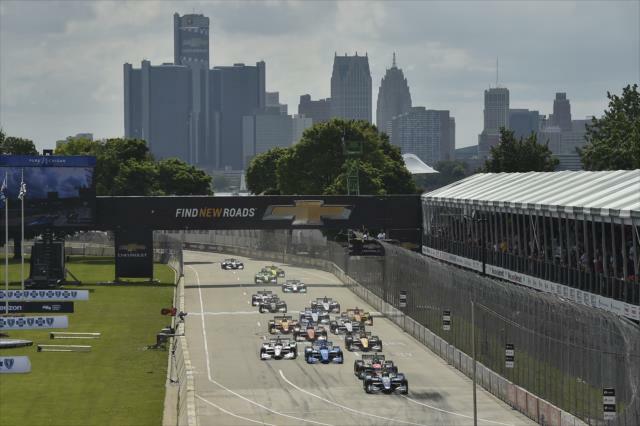 Belle Isle has held doubleheader IndyCar race weekends dating back to 2013.